I have been critical of Twitter as it very rarely seems to create dialogue but for some reason, this tweet caused a number of different deeper conversations of which I thoroughly enjoyed and helped with my thinking. As with any changes we make in education, it must come from a place of purpose. I like the question: What problem are we trying to solve? Last year, we had 4 teachers decided to create pretty significant changes to their classroom set up. The district encouraged us to make these changes and because we had to get the orders for new furniture in by a deadline to get the stuff for September, we spent some money and ordered what we felt would help with classroom design. The error I made in this is that we actually never discussed the purpose for each classroom. We ordered it because we thought it would help but because we didn’t define the purpose, we were not able to see if “it worked” as a school (knowing the teachers that made the changes, they put a ton of thought into it and likely had a clear purpose in mind but I never asked the question). Whenever we make changes, we should have a clearly defined purpose or a problem we are working on; when we have this, we can assess at various points of the year if our solutions are hindering or helping. one classroom that removed all the desks and used regular rectangular tables with chairs, shorter tables so students could sit on the floor, bucket seats, hokki stools, lap desks, and carpets. Lighting was also changed to a more natural light. one classroom that removed all the desks and used smaller tables that could be put together and pulled apart for various reasons, standing desks, bucket chairs, and stools. Less fluorescent lighting was used as well as some aromatherapy. one classroom that kept 2/3 of the desks but had options of couches and tables of various heights as well as some floor seating options. one classroom that removed the desks and had tables of various heights. A carpet area was also added. Throughout the year, we discussed how things were going with the new design. For those teachers who made pretty significant changes, it was a struggle for 2-3 months to help students to understand their seating options and the responsibilities that came with this (helping students to purposely choose the best fit for them). After Christmas, some teachers felt that students started to settle in and they felt that this really had a positive impact on classroom community (care, collab, social-emotional). Some felt that students who needed to wiggle and move could do this and this helped with their focus and behaviour. For another teacher, the removal of desks was not working for her class. Students had significantly more self-regulation struggles and teaching a lesson posed a large challenge (students were very distracted at tables, struggled with not having their own space, and there was less calm, learning time for individual students) so a few tables were kept but desks were brought back in. Talking to a few students, they actually preferred the desks as they had their own space and were less distracted by those at their table. As stated, we were not able to actually tell if the redesign helped or hindered students because I had not asked for clarity around purpose so we were not able to assess the impact. The only thing we could go on was how it “felt” or “looked” to staff members. As a school, I think overall that the teachers liked the moves but there were some challenges. Comfort: Comfort is important but does a more comfortable classroom lead to better achievement or more success? Classrooms need to be safe with a sense of belonging but we need to be careful that we are not putting comfort ahead of teaching and learning. I am more comfortable sitting on the couch or in bed but I get a lot less done than if I am at a desk. If comfort is the key reason for making these changes, keep in mind that some/many students need their own space and can become dysregulated if they have to share space or have too many options. How do improve comfort while also improving self-reg and/or achievement? Decor: We all want our classrooms to look nice for students, parents, and colleagues. It feels great when we have a classroom we can be proud of. When we shift the decor we always have to keep student learning at the forefront. Many people have said they are trying to model their classroom after a cafe – the “Starbucks” way of design. My concern with this is that people using Starbucks as a place of learning have a much different purpose than those in a classroom. People going to Starbucks are not learning from a teacher and are all self-directed. A high school learning commons area can use Starbucks as a model but for a classroom, there should still be an effective way for the teacher to teach a lesson (content knowledge is so important!) and having so many different areas with students facing so many different ways can be a real challenge. Even if we are just trying to change the look of our classroom so it is more trendy, we still need to be aware of these changes in achievement. Are we assessing the effect of our changes on the classroom? What if these changes actually hinder learning in the classroom? Student Ownership of the Classroom: Similar to the comments above, if student ownership is the problem we are trying to solve, how can we create solutions that not only help this but also benefit (or don’t take away from) student achievement? Ownership is important but this can be done in many smaller ways first to see if they make an impact (before changing the entire classroom design). Collaboration: Creating more collaborative learning spaces is not something new as teachers have been getting students to push their desks together for years. I do see the benefit of tables but I also see the drawbacks. If a classroom goes to all tables, this could actually make it less flexible as tables cannot be taken apart and moved around for individuals or smaller groups. Collaboration only works if students have enough content knowledge to actually contribute to the dialogue. Ensuring that the classroom works in a way that the teacher can still teach content knowledge is important so how do we create environments that allow for instruction, individual practice and reflection, as well as collaboration? Self-Regulation: For me, this is the most important reason to reflect on classroom design (and one that I have seen the most success). Beneficial changes in the classroom to help “down-regulate” and “up-regulate” can be done without having to throw out all the desks and bring in new furniture. Changes in lighting, adding calm areas of the room, and providing various seating options (actual seats like wobble stools and standing desks) can help with the whole learning environment and thus, help achievement. A few years ago, we brought in a couple standing desks and a few Hokki stools and then looked at the effect of written output. 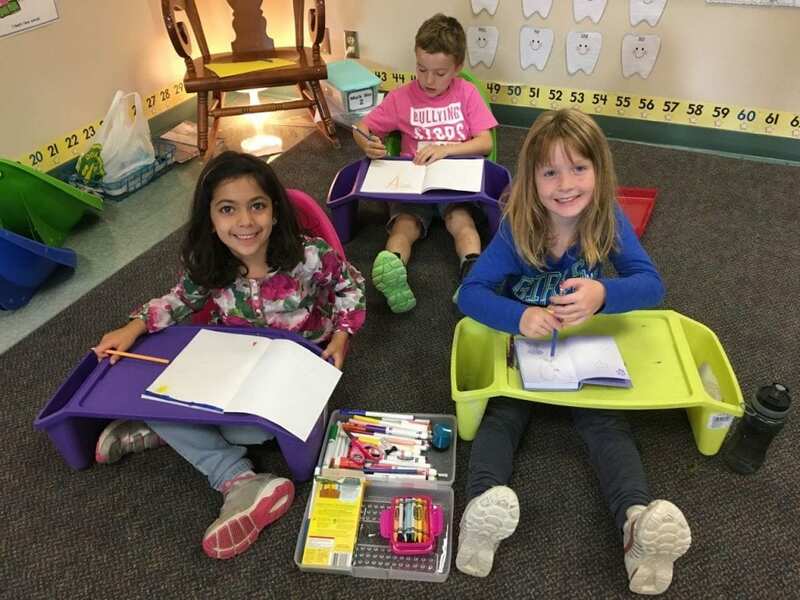 For some students, allowing them to stand or use a wobble stool helped them be able to write significantly more with a higher quality. For other students, the wobbling became a real distraction and actually hindered writing achievement. This creates a challenge as what works for one student may not work for others. What we did well was look at a specific way of assessing success/failure when we implemented a few ideas. When designing a classroom for self-regulation, seating options is just one thing to consider as there are multiple strategies that can be used with students to help them regulate themselves for effective learning. If a child is better regulated, their achievement should increase so this is an area that can be assessed throughout the year. Be specific on the problem, purpose of the change, strategies to implement, and markers for success. Without doing this, how will we know our time, efforts, and money are making a difference? Keep some desks*. I am not saying you need to keep all of them but before making big changes, switch up a portion of the class and leave a good number of desks for those students who need their own personal space. *Note that this is more for grade 2/3 and above as many early primary classrooms have not used desks for years and lessons/instruction take place at the carpet. Use small tables. Large tables actually take away from flexible seating as they present only one or two options for students. With smaller tables, you can put them together or move them apart as needed. If you are buying tables, you can also get tables that can be raised or lowered based on the need to stand or sit. Offer comfortable areas. When starting small (in elementary/middle), for quiet reading, students may enjoy a bean bag chair or a bucket chair. Be clear with students the purpose of these areas so that when there is instruction or individual or small group work occurring, these are not used. Offer seating options (stools, standing desks). You need not change your whole classroom to offer some seating options for students who may benefit from self-reg tools. Start with a few stools and some standing desks (or small, tall tables) to and see if student learning and achievement benefits from this. If we have evidence of increased success for an individual with a certain tool from past years/teachers, please embrace this as to go back to a standard chair may make the learning more difficult for the student. We can build on evidence from past success/struggles. Fail small*. One of the most common mistakes I have made is making significant (large) changes and waiting too long to see if it is working. If you have a clear understanding of the purpose and the strategies, use the defined success markers to see if what you are doing is effective. After a short time (weeks or 2 months), check to see how the strategy is working. If it is working… keep going, if it is not, stop and pivot. I have tried and observed classroom design that actually hindered learning so it is important to know the impact of the strategy. *HT to Simon Breakspear for helping me with this. If you are a teacher that does well (and whose students do well) in a classroom with all desks, don’t feel pressured to make significant changes unless there is clear evidence that it will positively impact your classroom. Some of the best teachers I have observed had classrooms with all desks while others had a variety of seating options. We are often quick to judge a teacher by what the classroom looks like at a point in time instead of moving deeper to look at the pedagogy and learning tasks that take place over a period of time. Be respectful in understanding that what works for one teacher and group of students may not work for someone else. Find what works for you and your students. Desks are not likely the enemy that some people seem to think they are. I have seen success in a variety of classrooms (yes, even desks in rows! 😉 and I would argue that the success is due to the teacher rather than the furniture or set up. At this point, I am not for or against classroom redesign; what I am for is us reflecting and sticking with what works and/or trying ideas to see if there is a benefit to our students. As educators, we have very little time so when we put in time and effort, we need to be aware of the changes we make and the evidence of the impact of these changes on our students. With not much research out there yet on the impact of flexible design, we need to be clear on the POINT (our why) of the changes and then check to see if our HOW is making a difference. As I am mostly thinking out loud on this one, if you have thoughts on why we should promote or be cautious of flexible seating, please share. Thank you to all those people at school and online who have pushed my thinking on this one.